You might think that, in this age of alarms, immobilisers and tracking devices, the humble steering wheel lock is like a relic from motoring of days gone by. But youíd be wrong, because sales of the devices doubled in 2017, as motorists took an old-school approach to solve a very modern problem. Tracker goes on to recommend some thoroughly traditional forms of vehicle security, including keeping your car in the garage, locking wheel clamps, pedal box locks, window etching and locking driveway posts. But thereís one recommendation that stands out ñ the use of the steering wheel lock. The chances are you may still have one in the garage or loft, but probably felt that it would be redundant in light of improved locks and high-tech alarms and immobilisers. But theyíre more popular than ever, largely because they canít be bypassed by technology and electronics. Some cover the entire steering wheel, others slot through the spokes, while others connect a pedal to the steering wheel to provide a deterrent. A determined car thief will be able to break the lock, either by cutting the device with an angle grinder, picking the lock or by using simple brute force, but the visual deterrent might be enough to discourage a criminal from having a go, especially if they arrived with a ërelay attackí in mind. 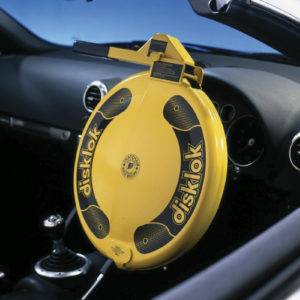 Criminals using this method rely on stealth, silence and speed ñ three things a steering wheel look will guard against. We visited a major high street retailer, where we found steering wheel locks available for as little as £20, and more expensive units on sale for £125. Even the most cursory of searches on the internet suggests that not all steering wheel locks are created equal and you would do well to research the pros and cons of each item. Weíre not saying that the most expensive locks are necessarily the best, but some of the cheaper units could be beaten in a few seconds. At the very least, youíll want the lock to remain effective for a few minutes. We reckon youíll spend more time searching the loft for your own ëretiredí steering wheel lock.